Start now saving on your money with this latest week mappins flyer, specials, deals, sales, promotions, offers and coupons. View the current mappins flyer to save on all products offerted by mappins ! Find all the deals & specials for mappins in the current flyer below. Mappins Jewellers began its Canadian operations in 1935, building on its founder’s experience with Mappins & Webb, a British jeweller. Today, Mappins has more than 60 locations across Canada, offering classic fine jewellery and watches to the Canadian consumer. With stylish mall locations in major retail centers, Mappins is known for its helpful staff, fine jewellery expertise, and personal customer relationships. Mappins expanded from its modest beginning into “carriage trade” stores in 7 major Canadian centers by 1970. The company grew to a national business, with a focus on quality merchandise of exceptional value. Exclusive designs and brand-name jewellery and watches added to the extensive merchandise assortments and variety of price points. Key services including jewellery repair, credit programs, and ear piercing were added over the years. 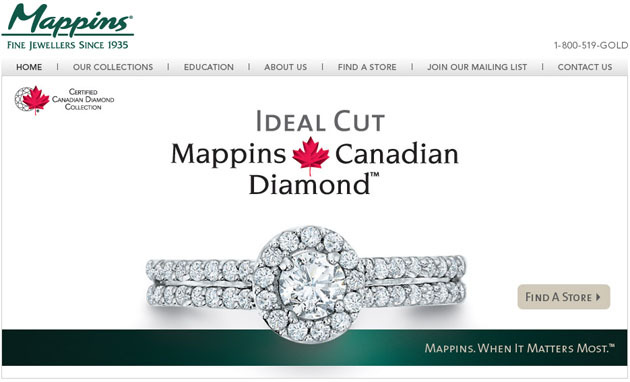 Mappins Jewellers continues to offer its unique and enduring styles to the Canadian consumer. Mappins has built the Exclusive Mappins Canadian Diamond® Collection to showcase diamonds mined, cut, and polished in the Northwest Territories. In addition, the signature Mappins Forever Collection adds to the depth of unique, romantic, and enduring designs to celebrate special moments. With three special diamonds – for your past, present, and future – this collection is especially appropriate for weddings, anniversaries, or other milestones that couples want to recognize. Exclusive Mappins collections continue to offer special styles at great value to the Canadian consumer. From engagement rings to fashionable and contemporary jewellery, Mappins offers a wide array of merchandise across a range of price points. Now, Mappins translates current fashion trends for enduring looks. Mappins offers designer styles in circle pendants, gold fashions, cultured pearls, and colorful gemstones. New fashions in platinum, titanium, and stainless steel have been added along with current materials and styles in watches and men’s jewellery.